A Prunus domestica L. cultivar. ‘Fruit large, obovate. Skin purple, marked with yellow streaks. Stalk stout, an inch or more in length. Flesh greenish-yellow, tender and juicy, with a rich, sugary flavour, and adhering to the stone. Shoots smooth. An excellent late dessert plum. Ripe in October. It will hang till it shrivels, and is then very rich in flavour.’ [Hogg – Fruit Manual p.241/1860]. 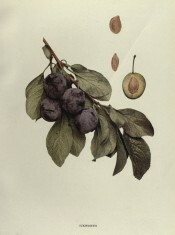 ‘Knight, the noted English pomologist, raised this plum from the Imperatrice fertilized by Golden Drop and named it after Ickworth Park, near Bury St. Edmunds. Knight aimed in raising this and other plums to produce a fruit containing sufficient sugar to keep well and not shrivel. In Ickworth he succeeded to a high degree.’ [Plums of New York p.220]. It was bred from ‘Imperatrice violette' with pollen from ‘Coe’s golden drop’. The fruit is middle-sized. The skin is purple, richly traced with golden-brown lines. The flesh is greenish-amber. A late plum for dessert use and good for making prunes. A hardy, vigorous grower. [Gard. Chron. 1842]. Listed in Addenda to the 1857 catalogue as ‘Ickworth Imperatrice’ [Plum no.21/1857].